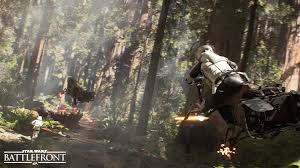 The new Star Wars Battlefront Video showcased content that had not yet been released which included maps, new modes, and hero characters such as Princess Leia and Boba Fett. Star Wars: Battlefront would be at the stores in a fortnight. The already released gameplay reveals some new characters, locations, and gameplay. This content has never again been present in a video format. You can have a look at the detailed forested world of Endor and Tatooine along with some added modes that only existed in writing. There is also some gameplays surrounding hero characters such as Darth Vander and others that have not been showcased before. Boba Fett is also shown on Tatooine as dominating the opposing side with his rocket, a jet packs and a flamethrower. This military equipment enables him to attack a huge army at once. Princess Leia is also shown as having a great skill in picking off the soldiers in a distance and throwing down a shield for her allies using the bane trooper skill. Emperor Palpatine also gets some time to shine at the end of the movie, zapping his enemies with chain lightning and the ability to spin through the air via force dash. The DICE and EA have reaped great success from the recent open beta for Star Wars Battlefront. In their statement, they confirmed that there were over nine million players that had logged into the game and played at least once. This might be due to the excitement it causes or player curiosity. The same is expected to be replicated when the new Battlefront hits the stores. EA hopes that the popularity of the video will be carried on the main game where it expects to sell over 13 million units. The number is not an overstatement. This was replicated in the recent beta numbers. One of the biggest franchises that EA own, Battlefield, has been selling at least 9 million copies of each game that was released. Many more fans are curious about the new gameplay, and others are riding on the excitement created by the video and anticipating for the real thing. Get some time and play the footage. Is the footage thrilling enough to make you look forward to playing the new game? Are you excited for the game? The Star Wars Battlefront game is launching on November 17. It will be available for customers using the Xbox One, Playstation 4 and the PC. Keep your fingers closed for some piece of Star Wars action.